Depression is a complex disease which is likely to involve several pathophysiological pathways. There is clear evidence that depression is associated with neurochemical and neuroendocrine alterations. Reduced activity of the serotoninergic (5-HT) and noradrenergic (NA) central systems are observed in a majority of patients with major depression (Garver & Davis, 1979). Depressed patients usually also exhibit an alteration of the hypothalamus-pituitary-adrenal (HPA) axis activity characterized by an hyperproduction of corticotropin-releasing hormone (CRH), which stimulates adrenocorticotropic hormone (ACTH) and cortisol release (Holsboer, Bardeleben, Gerken, Stalla, & Muller, 1984). 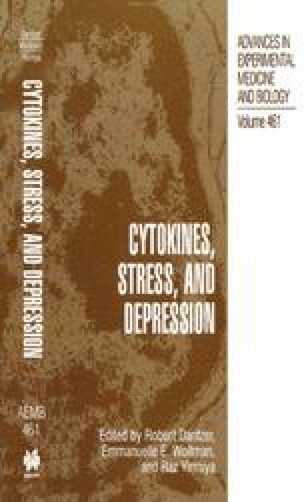 Therefore, the biochemical activity of most antidepressants, including selective 5-HT reuptake inhibitors, monoamine oxidase inhibitors, and tricyclic antidepressants, has been assessed on the basis of their ability to reverse the alterations of monoamine and/or HPA axis activities (Hollister, 1986). However, the metabolic activity of these drugs is not necessarily related directly to their clinical efficacy (Barden, Reul, & Holsboer, 1995; Blier & de Montigny, 1994). Despite repeated attempts, the neuro-hormonal abnormalities observed in depression have never been shown to predict therapeutic response, nor can they account for the symptomatic profile of the patients. Furthermore, depletion of 5-HT or NA in healthy individuals does not induce clinically significant depressive symptomatology (Young, Smith, Pihl, & Erwin, 1985). In addition, there are also some atypical antidepressants with known experimental and clinical therapeutic effects, but devoid of the classic antidepressant actions on central monoamine activity (Guelfi, 1992; Van Riezen & Leonard, 1990).